Join the discussion on our forums! 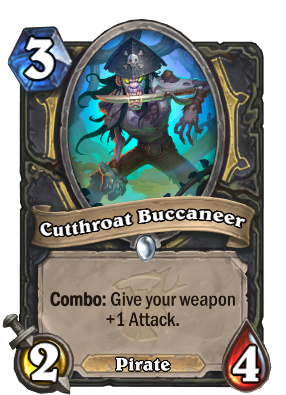 Come discuss Cutthroat Buccaneer over in our dedicated Cutthroat Buccaneer discussion topic. Combo: Give your weapon +1 Attack. In life he worked as a sword swallower. I thought this card was bad until I played it a few times in Kingsbane Rogue after Witchwood launch. It's clear you get 3 less attack for 1 less mana and you need to combo the card to activate the effect. But the card cost (3) makes it a lot more playable than Naga Corsair. It's also very easy to combo the card because of the low cost and it makes wonderful sinergy with Shadowstep and Valeera the Hollow's hero power. This feels weak, They should have made better replacement for Squidface and Naga Corsair, like a 2 cost echo card that gives +1 attack to kingsbane. Blizzard : "We have run out of ideas for Rogue"
Although this certainly helps Kingsbane. It is significantly worse than Naga Corsair. For 1 less mana, you get three less attack and an effect that needs another card played first. Honestly, need 1 more attack either on weapon or body. The card will probably lose on board and offers not enough of a buff to have good value. Cards like Naga Corsair, Southsea Squidface, and Goblin Auto-Barber all good stated minion that can impact the board and also give weapon buffs plus they had no prerequisite of combo meaning you won't typically play this card on three. So this is what Kingsbane Rogue gets in replacement of Naga and Squidface rotating out.. I'm not sure the deck is going to survive the hit. NNNNNNNNNNNNNNNNNNNNNNNNNNNNNNNNNNOOOOOOOOOOOOOOOOOOOOOOOOOOOOOOOOOOOOOOOOOOOOOOOOOOOOOOOOOOOOOOOOOOOOOOOOOOOOOOOOOOOOOOOOOOOOOOOOOOOOOOOOOOOOOOOOOOOOOOOOOOOOOOOOO!!!!!!!!!!!! I thought it was over! I thought we were done! Southsea Squidface: "Oh, but it will never be over..."
Naga Corsair: "You will never escape!" Pls go to a doctor or something. Another pirate to our collection. Well, okay, we'll take it. See, that's what I'm talkinga bout, mages get like 4 mana 2/2's that instantly play a secret that you discover, and then Rogue players get a neutrally stated minion (at best), with a combo, that's not even worth it and rewarding.. Why? Why is this not 3/4, it's a class card, not a neutral.. I just don't get blizzard sometimes.. well. It goes something like: Cause rogue has preparation...and backstab, and fan of knives, and a bunch of other broken classic and basic cards. So, as a heavy rogue player myself, we get weaker cards than other classes. Because, at the time, there wasn't something as busted at exploiting weapon buffs as right now :). The sole design of this card tells us clearly they don't want Kingsbane to be one of the best decks in standard, that's all. lol wait a minute did they actually misspell the name of the card on the card? What, that would be crazy! I really enjoy Kingsbane Rogue and I'm so mad the only card that supports the archetype is *this* bad... If I get this in a pack, I'm gonna dust it, then craft it and dust again.